1950's garage receipt for a new Ford Consul Mk1. Homepage. This page: Old receipt issued by a garage in Middlesex for the purchase of a new Ford car. This section of the site incorporates quite a few lavishly-illustrated invoices and letterheadings relating to old garages and automobile engineers. Not every business chose to have bespoke stationery designed especially for them though, especially smaller outfits and "one-man-band" operations. Some would simply offer hand-written invoices and receipts, while others would (and probably still do) use off-the-shelf stationery, to a generic motor-trade design. The item of paperwork on this page is just such an example. 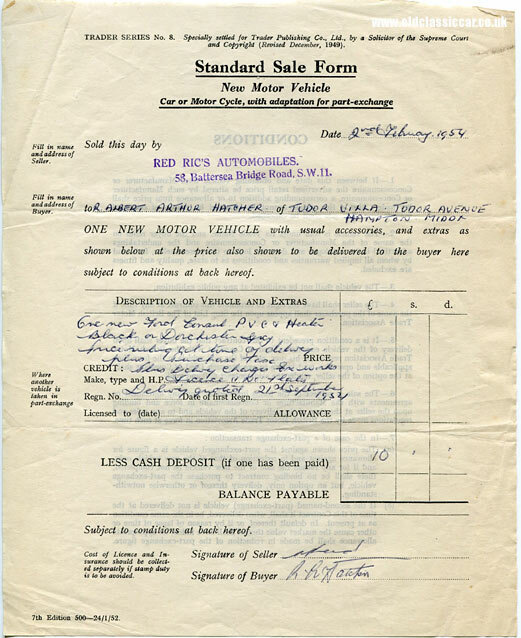 This receipt, for a downpayment on a new Ford Consul, was issued by Red Ric's Automobiles, a small agency operating out of high street premises at 58 Battersea Bridge Road, SW11, London. The location has been used in more recent times for the sale of foodstuff, but evidently in the 1950s witnessed the sale of motor-cars from its modestly-sized premises. The form was produced by Trader Publishing Ltd, for use by businesses who didn't have their own stationery. This receipt dates to 2nd February 1954, and reflects Mr Hatcher's deposit for a new Ford finished in Black and Dorchester Grey. Demand for new cars meant delays of several months could be expected, a note on this receipt suggests a delivery date of 21st September, some seven months later. As this receipt is from 1954, it must relate to the Mk1 Consul rather than the Mk2, which went on sale in 1956. Later receipts from different garages highlight Mr Hatcher's switch in allegiance to Vauxhall cars, but in the early 1950s he chose Dagenham-built cars, specified in this instance with the optional heater.